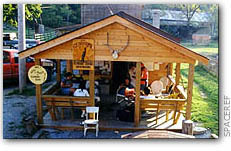 The region is very familiar to me since my wife and I have spent a lot of time there rock climbing and camping. What unfolded was part camping trip, part astronomy class, cruising around in diesel taxis, and a strange collision of ancient and modern hardware. More thoughts at the end of this story. When SETI (Search for Extraterrestrial Life) researchers come across a signal they suspect of being artificial in origin, they employ a series of tests to rule out terrestrial or natural explanations for the signal. One such test involves going "off source" - that is, swinging the listening device away from the specific star it was pointed at when the signal was detected. If the signal persists, then it is likely to be either of artificial terrestrial origin, or a natural emanation from a large portion of space. In either case, it is not likely the broadcast from an extraterrestrial civilization. If however, the signal stops the moment the receiver goes of source, only to reappear once contact is reestablished, one's confidence in the possibility that someone is indeed out there moves up a notch. There are, of course, many more things to check, but this is one of the simplest ways to eliminate spurious signals. After months of non-stop work, I really needed to go off source for a few days. For the past several months I had been meaning to get out to Seneca Rocks, West Virginia to check in with the folks at the Gendarme Rock Climbing Shop. You see, I [used to] run their website, and I have been too busy to get out there - or "get vertical'" for quite some time. Just as this particular need to go out to West Virginia was becoming obvious, along came another reason: I needed to catch up with some SETI folks - and they were going to be in nearby Green Bank for a day or so, an hour's drive from Seneca Rocks. Two perfect excuses to escape the Washington DC metro area, and go off source. John Denver was killed in a plane crash off of Monterey, California yesterday. The moment I heard this, I flashed back to 1981, Edwards Air Force Base, and the landing of Columbia after the STS-1 mission. I was about 20 feet away from John Denver as the Columbia dropped onto the runway. There was no doubt that he was excited. Later, he and I would compare notes about our new Canon AE-1 cameras whose operation we were both trying to figure out. As today would wear on, I'd read the local newspapers. Although he was not from here, John Denver had been adopted. The former governor of West Virginia noted that his song "Take me home country roads", although misrepresenting geography by placing the Shenandoah Valley and the Blue Ridge Mountains in West Virginia, had Nonetheless become a staple of weddings and funerals. In curious simultaneity, was the fact that this date was also the 50th anniversary of Hamlin, West Virginia native Chuck Yeager's breaking of the sound barrier in the Bell X-1 rocket plane. Both stories received considerable prominence in the local press. So much for going off source and getting away from space. I gave thought to avoiding all forms of news media for a day or so. That's what I did. I used these newspapers to light my campfire that night. The big deal in Seneca Rocks was the new traffic pattern at the intersection of routes 55 and 28 - er, "downtown". Change comes slowly here. Grudgingly, the locals admitted that it cut down on traffic accidents. Meanwhile the indoor climbing gym built in the shadow of a 300 foot high natural climbing site was losing money. Duh, I wonder why. I spent the night at Seneca Shadows campground. No tent, just a sleeping bag. What a show. The cliffs of Seneca Rocks are oriented such that they catch a riotous array of colors as the sun sets. I got the full program. The damn-near full moon rose over the hills and proceeded to dominate the sky for the next 7 hours or so. On a dark night, Seneca is a prime spot for viewing stars, meteorites, and satellites. This night, with the Moon all ablaze, the sightings were similar to light-polluted DC: few and far between. Nonetheless, the surrounding countryside was alit with the Moon's bright, but color-lacking, light. Orion appeared rather quickly, hinting at the closeness of Winter. Enough stars - and satellites shone forth to make the view something quite marvelous to fall asleep underneath. This in itself was worth the trip. I was in the middle of an almost empty campground surrounded by only a few late season climbers whose fires had long since died out. The sky was mine. My fancy backpacking stove was clogged and I was in no mood to fiddle with it. My wife, the camping gear wiz, is far more adept at figuring this gadget out - and she is not here. The only solution was to go to Harper's General Store and risk whatever passed as "coffee" today. I survived. A farewell to the instructors from the Seneca Rocks Climbing School as they escorted their clients to the waiting cliffs, and I was off. Green Bank is about an hour south of Seneca Rocks. There was little traffic on the road and I made good time, noting that dead deer were to be seen on the side of the road every 0.6 miles. Gee, how metric of them. Meanwhile, not only was distance being calibrated for me by landmarks (Bambi), so was direction. Every turn in the road brought forth another handful of satellite dishes - all pointing more or less south. The locals joke and call them "Morning Glories, the state flower of West Virginia". Funny thing: all of these satellite dishes were pointing me directly at my destination: The National Radio Astronomy Observatory, home of some really big dishes. It seemed as if the entire state had taken up SETI. After a nice hour of driving through near-peak fall foliage, still shrouded in morning mist, I entered Owens Valley. The road signs said I was close. Another turn in the road and I encountered a scene right out of the movie "Contact". If you saw the movie, think back to the shots of "the machine" in the distance at Kennedy Space Center. Flash forward to reality: Giant cranes and a nascent radio telescope could be seen with a band of mist at the base. I was later to learn that the movie's director never visited Green Bank for location shooting. Boy did he concoct an eerily similar view. After parking my car and loading up my cameras, I was off on a 1 mile walk to the 140 foot radio telescope where I was scheduled to meet Dr. Jill Tarter, from The SETI Institute's Project Phoenix . 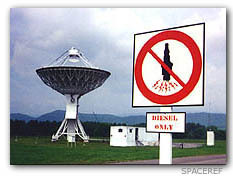 I had to walk because internal combustion powered vehicles and their radio-noise-generating spark plugs are strictly forbidden anywhere near the radio telescopes. Thus I entered into a curious realm of pedestrians, bicycles, diesel-powered vehicles, and interstellar communication systems. After 10 minutes or so I came around a curve in the road and saw an unusual sight. Ahead of me was the 140 Foot radio telescope dish aimed not up in the sky but, instead, right at me. As I got closer I could see that the service tower had been wheeled up to the instrument section located at the focus of the dish. Closer, and I could see people with yellow safety helmets moving about. As I got within shouting range, the people in the tower started to come down the stairs. Among them was Jill Tarter from the SETI Institute. A shout to "smile for the camera" elicited a big smile and a wave. Jill was accompanied by a local freelance writer and a German television crew from "Focus TV". We all got to know each other quickly and managed to have a rather enjoyable day as we preyed upon various aspects of Jill's time. Oh yes, Jill did have real work to do amidst all of our interruptions. Several years ago Congress demonstrated a collective lack of foresight and cancelled all NASA-sponsored SETI work. Out of this fiasco arose a private search effort: the SETI Institute's Project Phoenix. 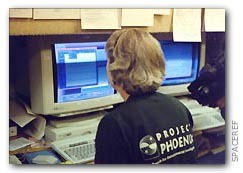 Project Phoenix is the privately funded continuation of the Targeted Search portion of the now-defunct NASA High Resolution Microwave Survey (HRMS). HRMS was, in turn, previously known as the Search for Extraterrestrial Intelligence (SETI). During the time when NASA funded search programs, SETI Institute scientists, engineers and subcontractors were primarily responsible for the design, development and operation of the The Targeted Search System (TSS) for the HRMS. Now that private funding has been secured, NASA has provided the TSS to the SETI Institute on long term loan. In order for the Targeted Search System to make use of this radio telescope for a SETI search special hardware needed to be installed. Just before I had arrived, telephone booth-sized receiver had been installed at the focus of the 140 foot radio telescope. 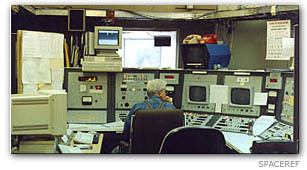 Several racks of hardware were installed within the control room, while a trailer (filled to capacity with more gear) was installed approximately 100 feet from the base of the dish. The trailer ("Mobile Research Facility") is totally self-contained and is designed to be transported (and plugged into) radio observatories all over the world. Inside the trailer are 10 or so powder blue racks and a sophisticated climate control (cooling) system. 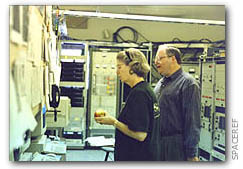 Jill noted that this facility, created in the early 1990s, had already been surpassed by newer, more powerful technology. Once this round of observations is complete, the entire facility is due for a massive hardware upgrade. As Jill and a co-worker unfurled the Project Phoenix banner atop the trailer, you could see evidence of why the project's name is so appropriate: on the side of the trailer, beneath a sheet of plastic laminate, one could still make out the raised "N A S A" letters of the old NASA "worm" logo. The SETI Institute was moving its Project Phoenix operations to Green Bank for the next few months. This involves not only the installation of specific receiver hardware in the radio telescope, but also the calibration of the radio telescope such that its operations could be controlled from Mountain View, California. The buzz word for this at NASA is "telescience". Now it is becoming known as "virtual collaboration". 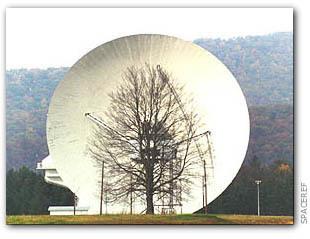 Once the dish's operators were certain that the basic connections for the new gear were all in place, the dish began to swing up off the ground. Soon it was pointing skyward. I was caught off guard by both the speed - and grace - with which this immense structure repositioned itself. The telescope was then commanded to go through a series of known source observations to make sure that everything was calibrated properly. After some initial glitches, things began to fall into place. Conducting a SETI search is a rather straightforward, and highly automated operation - that is, once all of the software and hardware can be coerced into cooperating. 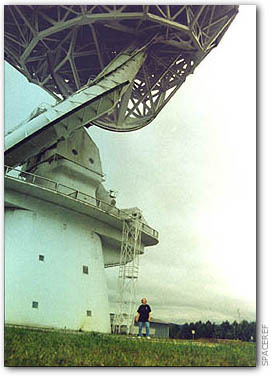 One of the calibration activities involved pointing the dish at a known radio source. First on the menu was Pioneer 6, a 140 pound solar satellite in an orbit between that of Earth and Venus and still transmitting data despite having been launched back in December 1965. As the German film crews' cameras recorded a computer screen, a few commands and a few minutes of observation revealed a strong signal. Further observations of Pioneer 10, now outside our solar system, were thwarted when the dish operator announced that the probe was on the other side of the Earth - hence unobservable. The process whereby the radio telescope is directed to a target is actually rather simple. Using a HP Apollo workstation running X-Windows, Jill called up a program called "Scheduler". From a menu of various search methodologies and pre-set procedures, she selected a pre-determined program for Pioneer 6 and presto - the search began. Later, Jill began another calibrative search - this time to SETI Star 4064 Right Ascension 18 hrs 49 min 49.3 sec Declination 23 deg 50 min 10 sec I was later to learn that this was a M3.5V * class star 10 light years away known in different catalogs as either GL 729 or V1216 Sgr or R 154. During the process of getting everything to work, there was lots of speed dialing going on. Much attention of late has been given at NASA to "virtual science" i.e. "telepresence" or "virtual collaboration". Such discussions usually revolve around how high bandwidth Internet connections at 10, 20, even 30 mbps which can afford researchers various interactive modalities. Well, this may be true, but I watched as simple tools such as a 1.544 mbps T- 1 link and a standard telephone line seemed to allow all the interaction required for a major SETI search. The next time you look up at the sky, remember that the light you see "now", rather the photons hitting your retina, ranges in age from minutes to billions of years. Just as your "now" is a curious snapshot of events spread back over time, so is this observatory. Someone (Einstein?) once spoke of life as a collection of non-simultaneous events. Well, SETI uses hardware that stretches back across a large chunk of this century. As you approach the 140 foot dish, you are confronted with a weather-beaten behemoth. It is old and dirty - not unlike the bridge of one of those aircraft carriers often used as a nautical museum. The structure is designed not only to bear the weight of the immense dish, but also to withstand the strong winds which bear upon it. The word "monument" seems to be more fitting than "radio telescope". Being so close to the cusp of the 21st century, and in such close proximity to something so inherently futuristic as listening for alien civilizations, you can't help but form a preconception of hi-tech gadgetry inside. Well, that is not what greets you when you enter the control room of the 140 foot dish. I was struck immediately by the decor - something very reminiscent of the 1960s Apollo-era offices I worked in at a southern California aerospace contractor in the early 1980s - you know, that government green and tan color everywhere, furniture, walls, ceiling - made all the more blatant by banks of florescent lights. As you turn the corner you are confronted with an array of electronic gear ranging from early 1960s to last week in vintage. Mechanical switches and relays, dials, and status lights - with little light bulbs from the 60s are mounted in racks adjacent to tape drives from the 70s, VCRs from the 80s, and 90s ethernet-connected UNIX workstations. Its almost as if someone was starting a technology museum. Next to the control console for the dish stands a double rack of hardware with virtually no external features, on wheels, painted incongruous powder blue. This is some of the special stuff installed for Project Phoenix. Its under-stated shape, and that out-of-place color only serves to accentuate the cutting edge aspects of the technology inside. Just as you've processed the visual scenery, the auditory channels start to kick in. Despite sound dampening tiles adhered on every possible free piece of ceiling and wall, the room is awash in white noise, undulating from a horde of cooling fans. Yet it all works - just like the 1970s vintage Space Shuttle flies with its newly installed 1990s avionics. Just because something is old doesn't mean it is without usefulness. At one point during the day, I went over to the Observatory's "dorm" to drop off my back pack. The dorm is an amazingly preserved throwback to the 1960s. The rooms all have heavy shades to block out daylight. Regardless of which portion of the EM spectrum they study, Astronomers have strange duty cycles, ones driven by the Earth's rotation. The only concession for the 80s or 90s was a ground fault interrupt outlet in the bathroom and a digital alarm clock. No TV. Even if there was a TV, it would be useless here - unless you hooked it to a satellite dish pointed at the sky. With the exception of simple intrusions by the late 20th century, I found myself in a pristine example of research institution architecture from the dawn of the space age - back in the middle of the century. The cafeteria is an equally well-preserved relic. The food is traditional Americana (no lattes, salad bars, or fajitas) - indeed, the prices even seem to have been preserved from the 60s. The tables are equipped with notepads and pencils to make mealtime notes easily portable. While the room can seat 100 people, no more than a handful of people are here at mealtimes. People came and went with not the slightest sign of being rushed in any way. Some arrived in old diesel-powered "Checker" cabs, others on one-speed bicycles whose paint faded 20 years ago, and others by foot. If it weren't for the giant radio telescopes looming nearby you'd have no reason to suspect you were in the midst of a major astronomical observatory. None whatsoever. Much of the campus is unchanged from the days when the very first SETI searches were done. Once built, things are maintained so as to be functional, but not distracting to those who work here. In some ways, it reminds me of an ancient monastery where monks quietly contemplate the wonders of the cosmos today while building upon the work - and walking in the footsteps - of their long gone predecessors. After a day of filming and hardware calibration, Jill and I managed to grab some food in the Dorm's cafeteria just as they were starting to close. After a few minutes, Jill realized that she needed to get over to the 140 footer to get some papers. Off we went on a diesel odyssey. Before you go anywhere, you need to unplug your vehicle. The diesel vehicles are all equipped with electrical block heaters. It can get very cold here and unheated blocks can become so cold as to prevent a diesel engine from operating. Each time you park your assigned vehicle you need to plug it in. We managed to make it down to the 140 footer wherein Jill grabbed her papers. As we walked back from the telescope's control console, the telescope's operator (Don) asked me if I had been to "The Gendarme" climbing shop in Seneca Rocks (I was wearing one of their T-shirts). I said yes. A conversation ensued wherein I learned that Don had not only been to the Gendarme's website, but actually knew the owner of the Gendarme. Yikes, what a small planet. As we walked out of the control room, Jill remarked upon the coincidence that this fellow would know me - and my website. There is a curious irony in hearing Jill Tarter, of all people, say this. Recently, I sent her an email to see if she'd be around when I visited California. She responded that she was in Japan and would be there for a while. A few minutes after the email exchange I went to shut off the TV only to see Jill on MSNBC. Flash forward a month. Just after I had confirmed my Green Bank visit with Jill via email, I told my wife I was going to West Virginia to catch up with Jill. My wife said "speaking of the devil, come out here." I did. There was Jill on the Discovery Channel. Jill's day was pretty much eaten up by the German film crew - a really nice team who were ever so polite when it came to asking Jill if she'd get in front of the camera yet knowing all the time that Jill was equally eager to tell yet another viewing audience why this research is so important. It is a shame that more scientists do not hone their public relations skills. Jill Tarter is a rare type of scientist. Rare in that she not only knows her stuff but, in the tradition of her now departed friend and colleague Carl Sagan, she is a natural before the camera. No need to say "roll" - she is 'with it' the instant the camera is on and rattles off the SETI mantra without a pause. Second takes are not her fault. After our jaunt in the diesel truck, we managed to grab some time in the hopelessly retro 60s-style lounge on the second floor of the dorm. Again, as you drink in the history of the place, you could almost hear SETI pioneers discussing the results of the very first sky searches and how to do it better next time. What would they think of the toys that are used today? Flash forward to now where today's quantum leap in observational technology becomes out-dated at an ever-increasing pace. Where will we be 10 years from now? Contact? Jill deals with the Jodie Foster/Contact burden well. Despite some of the movie's pre-release media attention, Carl Sagan's original character Ellie Arroway only has some general similarities to Jill Tarter (female, astronomer). There are many other similarities between Jill Tarter and Ellie Arroway - but these similarities are common to a large group of SETI researchers and Astrobiologists: a child-like sense of wonder and a zeal to explore only thinly veiled by professional training with an added (and healthy) lack of patience for bureaucrats. The fact that Congress, in its lack of imagination or historical perspective, killed government funding of SETI, is clearly bothersome to Jill. A trivial amount of funding and effort (when compared to what we as a culture waste on so many other things i.e. pizza and lottery tickets) could have societal and technological impacts far beyond anything in human history. Then again, being free of the nonsense that goes with government funding also seems to be liberating - to both Jill, and her team. I found myself thinking "Gee, here they are, 3 years after the cessation of government funding, with a multi-million dollar endowment, running a rather robust SETI program on the cutting edge of technology, with zero government funding. Sure, it would be nice to get some tax dollars, but is it no longer necessary? Indeed, is it even desirable?" There was something rather poignant about these large radio telescopes, each of which could detect - and carry on - a conversation with someone many light-years away. 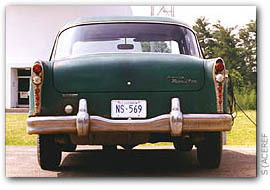 Given various calculations of the likelihood of intelligent, communicative civilizations out there, such as the Drake Equation, one could almost expect to hear a cacophony of voices crying out to be heard the moment you turned on the equipment - like listening to an AM radio while driving across Kansas late at night. Indeed, radio transmission from Earth now form an ever-expanding sphere more than 150 light years in diameter. Why the silence then? It isn't as if we haven't been listening. As Enrico Fermi is supposed to have said back in 1950, "Where are they?" Are we listening to the wrong stuff? Not listening carefully enough? Or is this more an issue of adapting our activities to a timescale far greater in scope than anything we've previously tackled? Instead of framing our expectations around science fiction depictions where this could all happen tomorrow, perhaps we stop to look at the ancient Egyptians who managed to keep their culture thriving for several millennia. When asked about the reports of putative fossils found in Martian meteorites, Carl Sagan said "profound claims require profound evidence". Although I would be hard pressed to come up with a means of measurement, perhaps the calculations regarding the prevalence of intelligent, communicating civilizations, ought to include another factor. As such, I would like to propose to add a corollary to Sagan's comment, and another factor for Drake's equation: profound discoveries require profound patience. It had to end eventually. No more than an hour or so after gazing back at the antennas in the mist, I was driving past strip malls which would inevitably lead to the suburbs of Washington DC. I suppose if I made this trip too often, the various high- and low-tech juxtapositions I had seen - and the wonderful ironies they revealed - would start to fade in their significance. It sure is nice out here - and I could easily get used to the pace of life. I run a number of websites which have managed to attract a readership spread out across the world. Several years ago, just after I had put my first, rather crude website online, one poking fun at the STS-69 Space Shuttle mission, I was startled by hearing a familiar noise at a strange time. It was around 3 am EST. The webserver I used at the time had a rather loud disk drive. Each time someone requested a page from the webserver, the computer would click and whir such that I could hear it in the next room. This particular night, the first day of the Shuttle mission, it woke me up. Why the sudden upsurge in access at 3 am I wondered? It dawned on me a moment later. Europe. They were just getting to work and checking in to my website. Over the next several days, I would watch the webserver's activity across the day as it waxed and waned - all driven by the spinning of this planet and where the sun shone - hence where humans were awake and websurfing. To have this device in my home, simultaneously connected to thousands of points all over the planet, serving up information on a spaceship orbiting the same planet, acting as a realtime indicator of human activity vis-a-vis the Earth's spin was, well .... I experienced multiple glimpses of what it was like to think on a planetary scale. At one point while hanging around the control room for the 140 foot dish, I had to move out of the way of the German film crew's camera as they filmed Jill. Since things were a bit crowded, I found myself closely surrounded by racks of humming electronic gear - the innards of a device which was scanning the cosmos like a giant searchlight in reverse. I began to think back in time to one night at summer camp as an 11 year old when I pointed a flashlight at the sky and watched the beam seemingly converge upon some point far, far away. I had been thinking of a TV show I had seen where the host suggested that one or more of the photons leaving my flashlight could make their way to fall upon the surface of a planet orbiting another star - perhaps to the eye of a boy like me who was also looking up at the sky. After going "off source" to see if the signals I had been receiving from life were indeed signals - and not just noise, some things became much more focused. The message I took home from West Virginia was one of fascination tempered by frustration. The fascinating aspects of the trip have already been covered. The frustrating aspects require some personal venting. SETI is such a straightforward technical task with a disproportionately profound potential payback. Even the most exhaustive search could be done at a cost which is a fraction of a fraction of a fraction of the cost of the buildings our elected representatives regularly erect and then name after themselves. There is no shortage of politicians willing to line up to support projects which will appear in time for the next election - and also last for a century or more. Nor is there a shortage of politicians eager to kill a project whose hardware isn't a prominent landmark or whose payback may well be decades away - especially one whose constituency just happens to live light years away and can't vote or make political contributions. Just wait and see what happens when "Contact" does eventually happen. Just as was the case in the movie, politicians and bureaucrats will push to the head of the line to simultaneously take credit and try and steer events for their own purposes - this after killing all funding in the first place! Perhaps the Drake Equation needs another variable: self-interest. Perhaps a privately funded SETI program is desirable after all. If for no other reason than being freed from the burden of government regulation and the uncertainty that goes with being linked to political moods. Still, such a grand search for knowledge - and its preservation, once found - is something that great nations - and great civilizations - have always supported. And it was always done with tax dollars. Indeed, the most enduring of all ancient human public works projects (Stonehenge et al) were designed for looking at the stars - and passing this knowledge on to future generations. A new millennium is almost upon us. Everyone seems to be falling under the trendy spell of thinking in profound millennial terms. So be it. As my contribution to all the millennial hoopla, I want to know who will be the first politician of the new millennium, with an eye firmly affixed upon posterity, who will push for SETI funding. We can even name an antenna after them. Just remember: you can still read inscriptions praising politicians on the tax-supported Pyramids many millennia after they were carved - and the Pyramids are very clearly oriented to the stars. 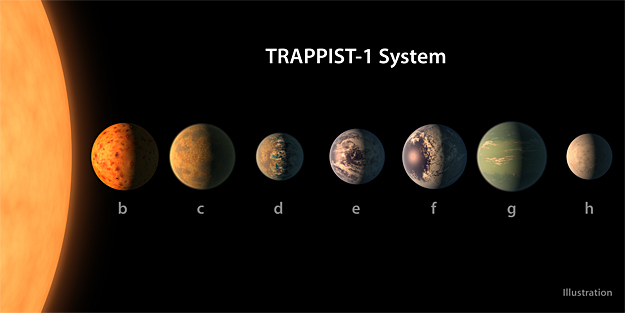 TRAPPIST-1 has 7 Earth-sized planets - 3 are in its habitable zone. Well, Seneca Rocks really hasn't changed at all. Unless you count the new visitors center. Otherwise I am hard pressed to point out any significant alterations. Green Bank is pretty much the same as well. 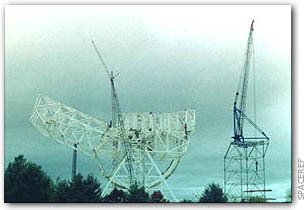 The large dish under construction when I visited in 1997 is now operational. But shifting priorities and declining budgets led the Green Bank Observatory to morph into a non-profit venture. One of its largest customers is the Breakthrough Listen project. The SETI effort I saw in 1997, while well thought out, was a shoestring effort. Now with the construction of larger listening devices around the world and advances in technology, listening is a much more robust activity. For me, visiting aging hardware and listening to old decrepit spacecraft like Pioneer 6 at Green Bank was somewhat humorous. A decade later I was co-lead on the Lunar Orbiter Image Recovery Project which brought moon imagery from the 1960s back from the past to be seen in all of its modern restored majesty. That led to another effort a few years later, the ISEE-3 Reboot Project, which involved using the largest operational radio telescope at the time (Arecibo) to wake up an old NASA spacecraft and make it do things again. I am now convinced that there is value to be gleaned from using a range of technology - old and new - to explore the universe around us. I visited Jill at Green Bank shortly after "Contact" was in theaters. We've seen many films since then dealing with the same topic with "Interstellar" and "Arrival" being among the better ones. But the whole issue of contacting alien intelligence is still as speculative now as it was in 1997. Now Breakthrough Starshot is designing interstellar spacecraft that could leave Earth in a few decades. And people now talk about this with a straight face. Life needs a place to develop into a technological civilization. In 1997 only half a dozen or so extrasolar planets were known and they were all unexpectedly weird and not seen as being at all conducive to life as we know it. Now there are thousands of known exoplanets and a significant and growing number of them reside within the habitable zone of their parent star - including the star system closest to our own. Add in the chemistry, planetary, and astrobiology science that has blossomed to examine what these worlds may be like - and the increasing number of environments where life may be possible, and the prospect of there being life out there only seems to increase with every passing day. But despite a lot of listening and some false alarms we have still heard nothing from minds other than our own. As Enrico Fermi said "where are they"? Its not as if we are not trying. We just need to try harder. I'm looking forward to revising this article again in 20 years.